I was delighted to be joined by Caroline Flint MP, Labour’s Shadow Secretary of State for Energy and Climate Change, who came to Chiswick and Isleworth this week. Ms Flint, a former Osterley resident, joined on a visit to the Energy Saving Trust in Chiswick followed by a panel discussion on energy issues at West Thames College in Isleworth. 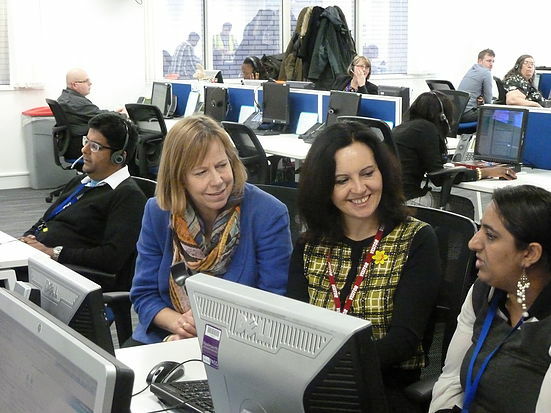 At the Energy Saving Trust offices in Chiswick, Caroline and I were shown the Energy Saving Advice Service Call Centre where over seventy agents offer impartial advice to 300,000 callers each year on how to save energy in their homes and businesses. Working on behalf of the Department of Energy and Climate Change the agents help the callers to identify all the energy saving improvements that they could make to their homes and whether there is any financial support available to them. A recent survey suggested that two thirds of callers have either installed or plan to install an energy saving measure as a result of the advice provided. Labour is the only party that will take on the big 6 energy companies and fix a broken energy market so it works better for average families. This Government has done nothing to make the energy market fairer, more transparent or more efficient. And, despite David Cameron promising us the greenest government ever, environmental issues have been thrown on the scrapheap. We know the energy companies are quick to raise prices when the cost of energy rises but don’t cut them properly when it falls. The market hasto be reformed so that people can feel confident they are paying a fair bill. I’ve met many people locally on the doorstep who are really struggling to pay their heating bills.